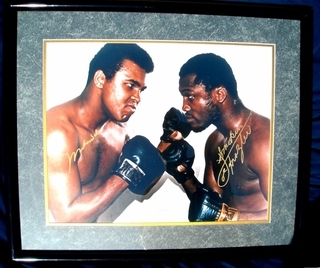 AutographsForSale.com offers dozens of authentic hand-signed autographs from boxers past and present on boxing gloves, photos, magazines (Muhammad Ali and Joe Frazier dual autographed 16x20 photo matted and framed shown at right) and other items. We have a wide selection of autographs from boxing champions including Muhammad Ali, Oscar De La Hoya, George Foreman, Joe Frazier, Gene Fullmer, Thomas Hearns, Larry Holmes, Evander Holyfield, Roy Jones Jr., Jake LaMotta, Sugar Ray Leonard, Manny Pacquiao, Vinny Pazienza, Floyd Patterson, Mike Tyson, Fernando Vargas and more. Mills Lane autographed 1993 Joe Louis First Day Cover inscribed Let's get it on!